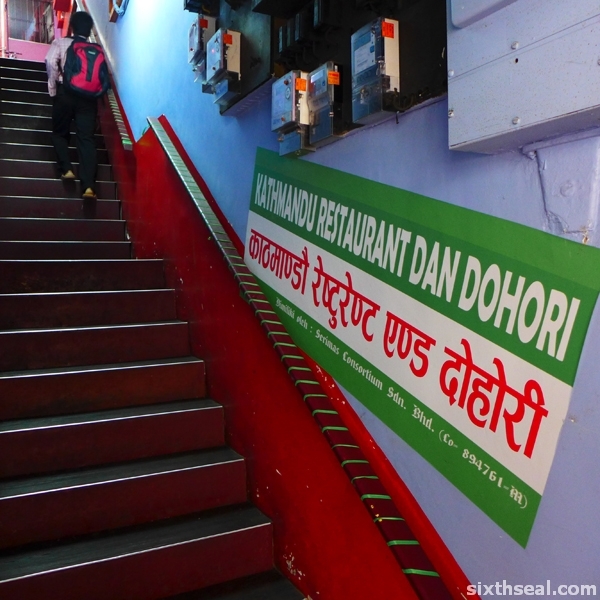 It’s a good toss-up about whether this place is called Indreni Restaurant (which is what is printed on the menu) or Kathmandu Restaurant Dan Dohari (which is what the staircase says). What I do know is that you’ll have a tough time ordering in English. 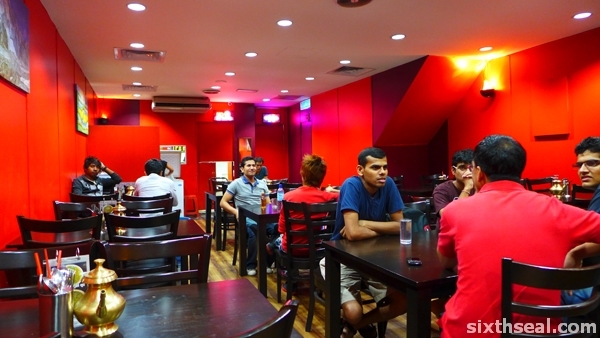 The place is staffed by Nepalese immigrants – there is one friendly girl who tries her very best to speak bits of barely understandable English but communicating will largely be relegated to largely pointing at the menu and the only English-speaking waitress trying to say “pig or chicken”. 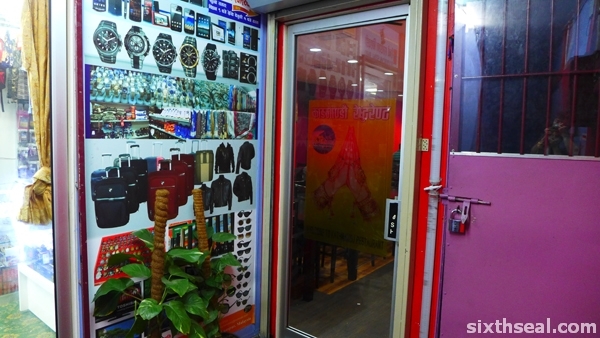 It’s quite a hard place to find too, considering the restaurant’s name is partially obscured by a huge banner and it’s on the second floor, beside a store, also Nepalese owned and a dodgy locked stairwell which I think leads to living quarters. I didn’t know we have a Little Nepal, but there you go. Even the papers are all from around the region. 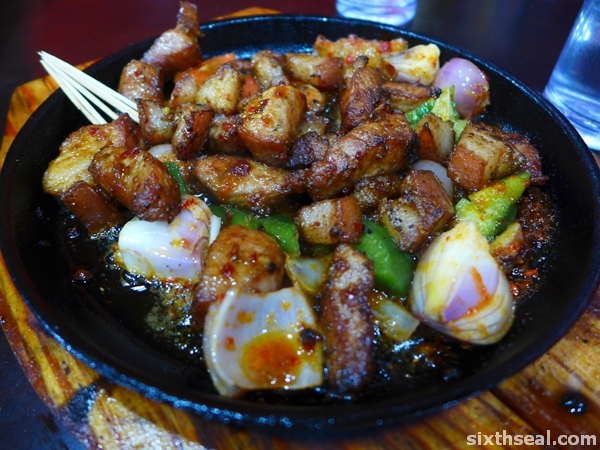 This is a sizzling dish of pork that’s meant to be eaten with beer or liquor as a side dish. It comes to your table still violently popping off bits of oil everywhere and it’s a pork dish with tomatoes, onions, shallots, peppers and chilli oil. Lots of chilli oil. It’s really, really good though – spicy hot pork that’s coated with chilli oil and dried chillis. You have to eat it when it’s still hot though. 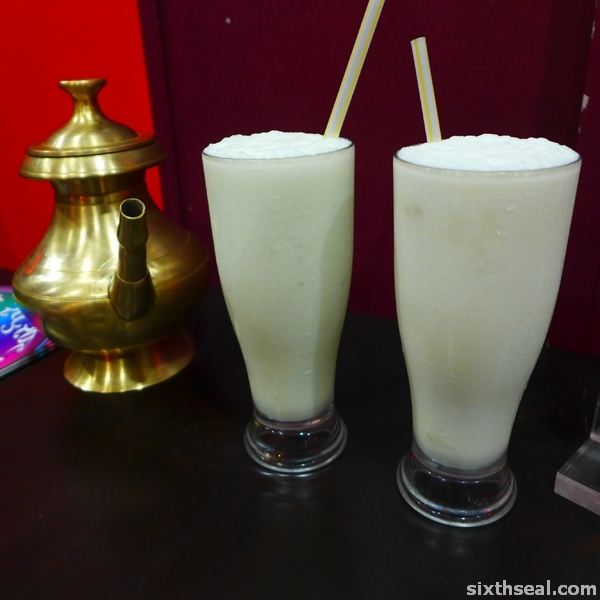 This is yogurt drinks – home-made and very sour. I had the plain one but you can also opt for fruit based choices. The apple one beside is made with real apples blended with the yoghurt! 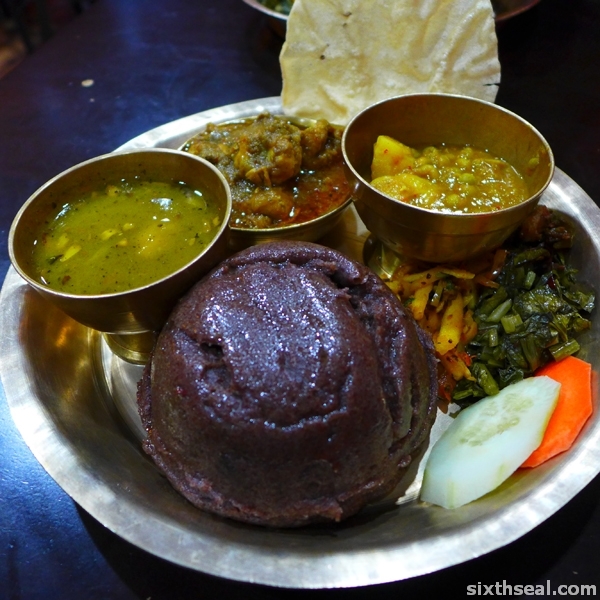 You can have this in either pork, chicken or mutton (chose the latter) and it’s served with sides of pickled vegetables, dhall and a soup that tastes interestingly neutral-sour. 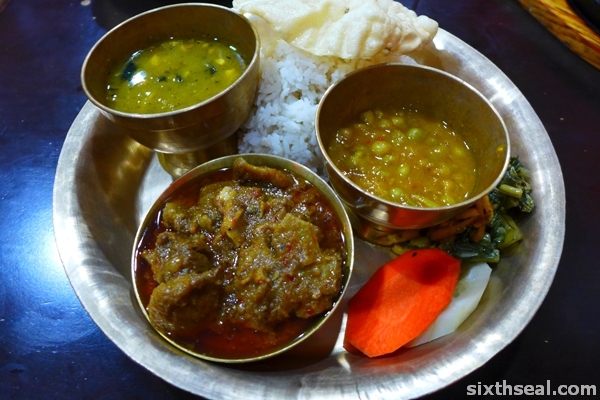 The mutton/chicken/pork is in curry form and there’s more fat than meat and I soon come to realize that this is place catering for Nepalese immigrants. 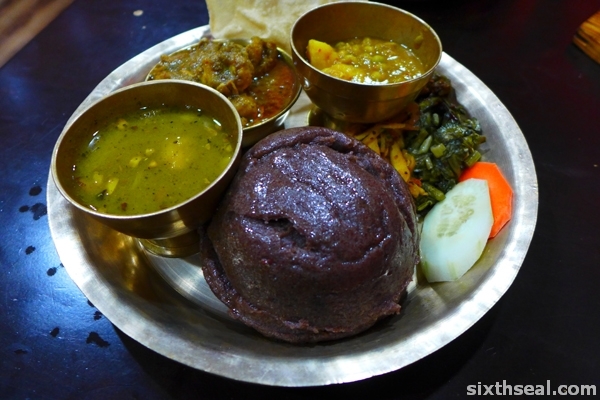 This is another set rice curry combo with all the same sides as the previous one, except dhindo comes with a mound of purple goo in lieu of rice. 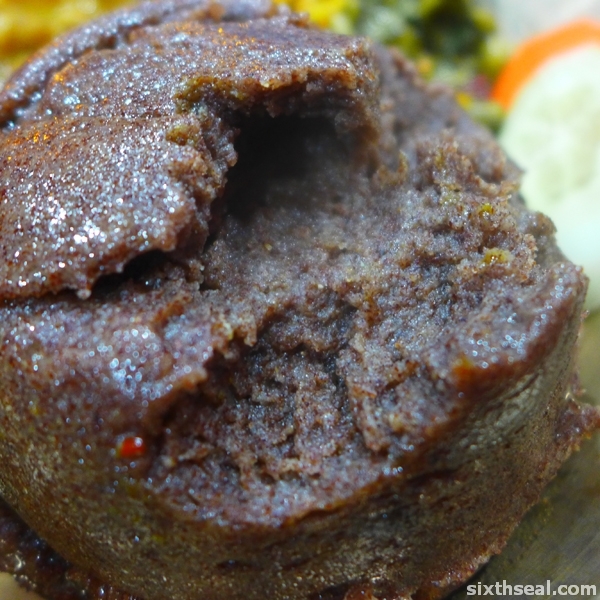 The purple pudding seems to be a mix of semolina/flour/whatever and it tastes like crumbly starch that has been made pliable with oil. I couldn’t get the waitress to explain what it is, the language barrier is too high. This is a very interesting place to go to. The clientèle seems to be all Nepalese migrants who comes in to drink bottles of whiskey in small glasses. I’ve got to go back and try that sometime. 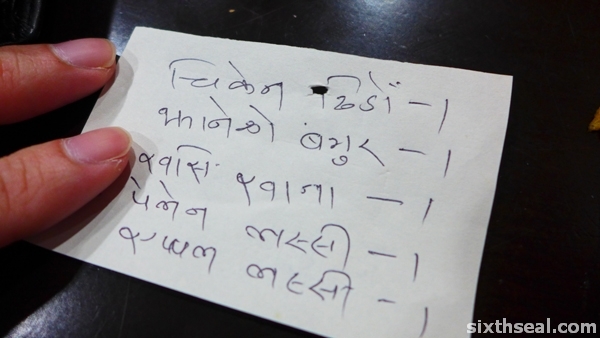 They also serve good momos (Nepalese dumplings) but like I said be prepared for a significant language barrier. 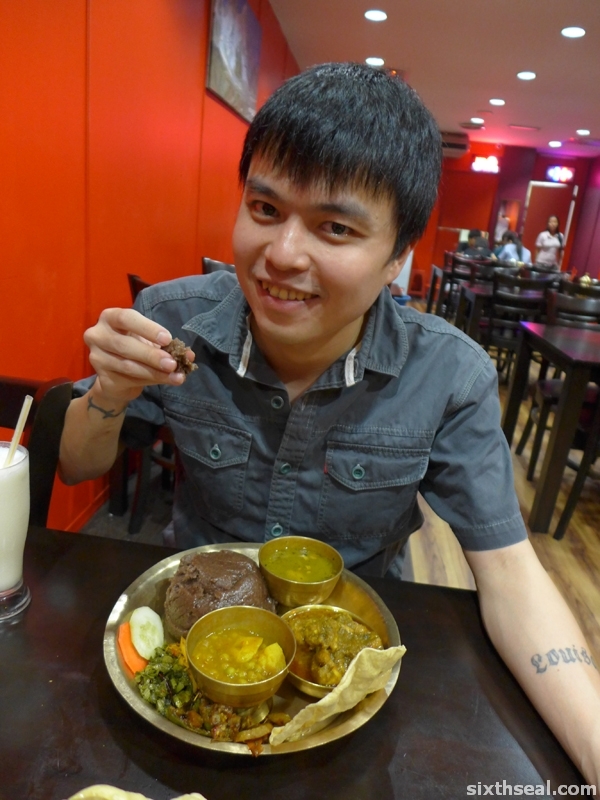 I thought it was a lot of fun trying to get myself understood with the waitress, who was very patient and friendly. 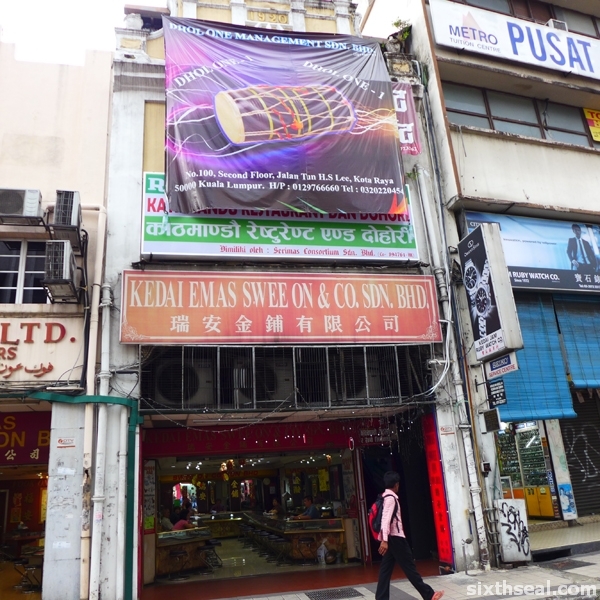 Kathmandu / Indreni Restaurant is certainly an intriguing nook in the middle of KL. The price is cheap for us but not necessarily for an migrant worker, so I’m guessing this is a relatively nice place to socialize and drink. I enjoyed my time there but not the food (except the excellent yogurt and interesting purple dhindo).